What does it take to be a competitor? What does it take to put your self out there in the public spotlight? What does it take to be judged and ranked on 15 minutes and 12 espresso drinks when you work hard for 40 hours every week grounded in passion and purpose? It takes a barista like Emily. Like Braden. Like Zack! And all the baristas at Tazza D’Oro who cheered on their co-workers, showed up for the dress rehearsals, helped pack all the boxes for competition, ironed their table cloths and took them shopping for supplies. Braden was the last of the Tazza D’Oro competitors. His whole performance was around show casing the very rare and spectacular Panama Esmeralda. We believe this is the first time the Esmeralda has been used in competition. Not only is the coffee extremely expensive, but very finicky as an espresso. Braden took the risk and served a “cup of gold” this afternoon. We are also pretty sure the judges NEVER tasted any espresso quite like the Esmeralda. Damn that was fun! Tonight, we have a few disappointed baristas. We didn’t make it to the final round of 6 competitors. Their scores were high and very respectable. But as all true competitors, they participated with some expectation. And for me, as the owner, I am so freaking proud! 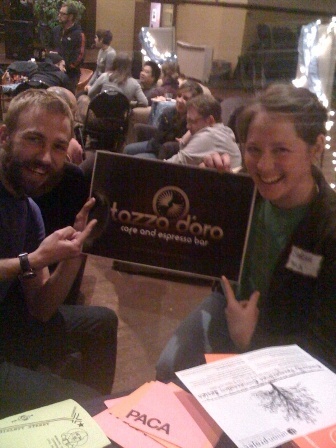 Emily, Zack and Braden were a total representation of all the work and dedication of the other 9 baristas who work at Tazza D’Oro. These competitions are always a tough line to tow. 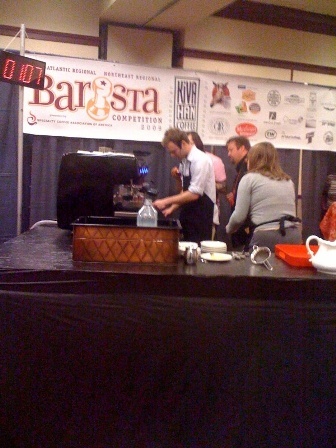 The competitions are very focused on the individual barista, they take a lot of time, commitment, and money. But they legitimize, for now, the very real passion and professionalism it takes to be a rad barista and coffee establishment in the coffee industry. 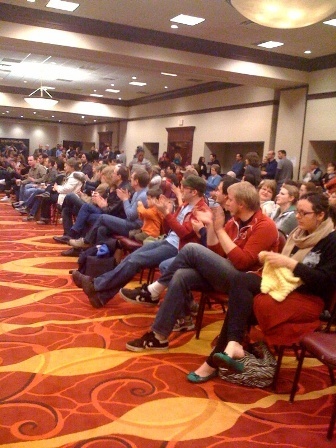 Thank you to all the 12 or more customers who showed up today to cheer us on. That’s another win, BTW! Here are pics from the rest of the day and the barista event we hosted at the Union Project last night. 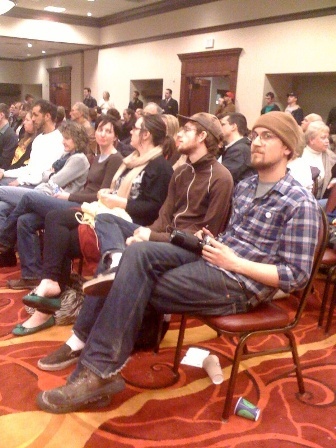 Standing room only in the burgh, watching a barista competition? Looking for another Superbowl? 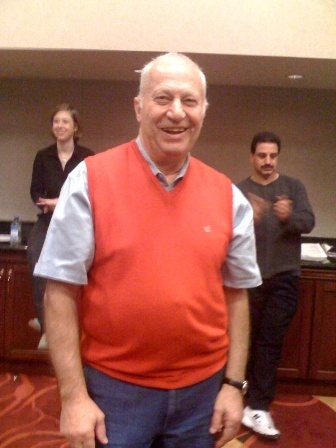 And then, Gianni, awesome Italian guy and paisano! Gianni is with Nuova Simionelli Espresso Machines. In Pittsburgh we say How ya doin’? instead of, come stai’? 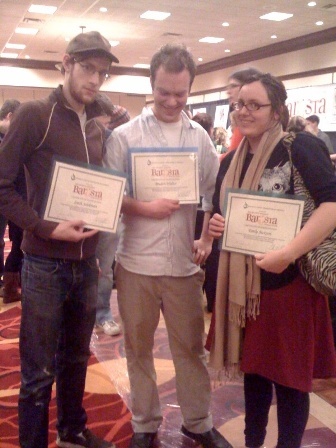 Congrats to all Tazzo participants! Great sportsmanship and wonderful work. Great work Emily, Braden, and Zack! You did yourselves and Tazza d'Oro proud with your performances. Amy as always it was nice hanging out with you. You're a wonderful spokesperson for our industry. Now we can all get back to "normal". Great work, Tazza. I had so much fun watching and cheering for you guys. Can't wait to stop by to try a competition-style cap (if any of you can bear to make another!). Go Pgh Coffee!